Flights arriving at Gatwick Airport had to be diverted due to high winds as Storm Katie ensured the Easter weekend continued to be wet and windy. Bricks were left strewn across the road after the roof of the Duchess pub in Battersea was ripped off by Storm Katie. London Fire Brigade have said that firefighters have battled through 110 incidents amid Storm Katie. 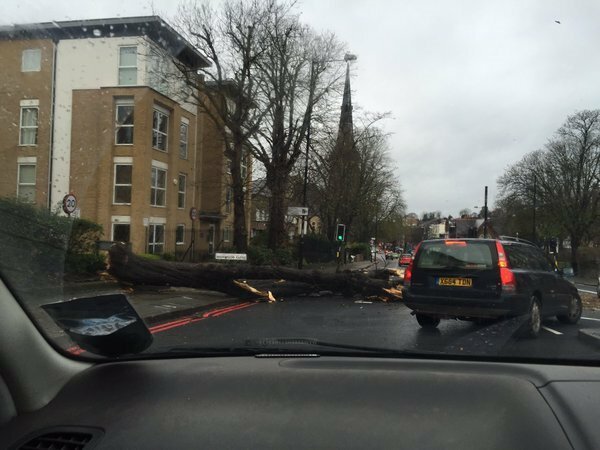 Storm Katie has battered parts of the capital - more than a 100 flights were cancelled or diverted and properties have been damaged and there has been chaos on the roads too. Winds of almost 70MPH were recorded in south London - and for those who did manage to fly back into our airports - it was a very unpleasant experience. Since midnight firefighters have attended an increased number of windy weather related incidents including scaffolding in a precarious position and fallen trees, the London Fire Brigade said. Fire crews battled atrocious weather conditions to rescue 13 people including five children after a fire broke out in a restaurant below their flats on Hounslow High Street on Sunday night. High winds blew off the roof of a pub in London as Storm Katie battered the capital overnight. The roof of the Duchess pub in Battersea was damaged by the storm and bricks left strewn across the road. Storm Katie has caused 26 flights to be cancelled and a further 23 to be diverted from Gatwick so far today, the airport announced. While no terminals were closed, winds of up to 70mph caused significant disruption. High winds and flooding saw flights cancelled, train lines blocked and ferry services halted. Gales or severe gales accompanied with periods of rain, often heavy. The rain will quickly clear eastwards by midday, with gales gradually easing. Sunny spells and lighter winds developing during the afternoon, with a few scattered showers arriving before dusk. Maximum Temperature 11°C. Tonight, expect a chilly night with clear spells and scattered heavy showers, carried along on a brisk southwesterly wind, this particularly gusty around coastal areas. Risk of thunder, especially in the south. Minimum Temperature 3°C. A crane has been bent over double in the high winds amid Storm Katie in Greenwich, east London. The crane was seen apparently collapsed in Greenwich, east London. The road has been closed and motorists and pedestrians have been advised to avoid the area.